Find artworks, auction results, sale prices and pictures of Maria Luigia Raggi at auctions worldwide. Notes: These pictures are an important addition to the oeuvre of the recently rediscovered painter Maria Luigia Raggi, whose name first came to light in an exhibition curated by Professor Cottino in the Fondazione Accorsi, Turin (La donna nella pittura Italiana del Sei e Settecento. Il genio e la grazia, 2003, pp. 191-2, nos. 53-4, illustrated). 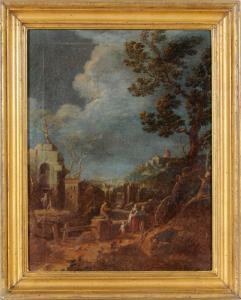 On that occasion, four Capricci on tempera were exhibited, one of them signed 'Maria Luigia Raggi'. Unfortunately, in spite of extensive archive research, nothing has been found about her life or career. 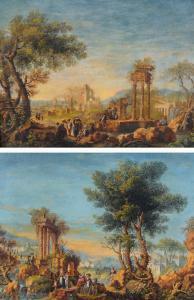 Like the four pictures exhibited in 2003, this pair are by the same hand as a group of pictures discussed by Andrea Busiri Vici, under the pseudonym of the Master of the Prato Capriccios, twenty of which are in the Galleria Comunale, Prato. Apart from two that are painted in oil, the oeuvre of the anonymous master today identified as Maria Luigia Raggi, are all tempera on paper, 'in una colorazione chiara e festosa quasi più arieggiante a quella di una vivace porcellana settecentesca', and mostly horizontal (A. Busiri Vici, Un anonimo paesista settecentesco di rovine romane, in Scritti d'Arte, B. Jatta, ed., Rome, 1990, pp. 421-9). 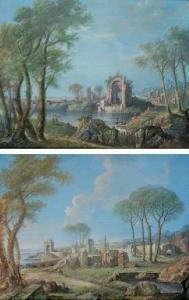 All these pictures were formerly attributed to van Bloemen, van Wittel, Busiri and Anesi. 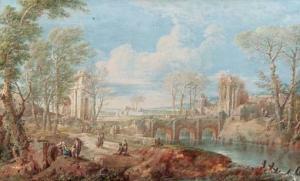 The variety of these traditional attributions, together with the fact that most of them are still in their original Roman frames, allow us to believe that Raggi was most probably active in Rome, had a deep knowledge of Roman ruins and of the Roman countryside, and was well aware of the development of the Roman landscape painting tradition. 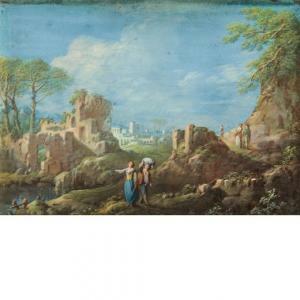 The first picture in this lot has strong compositional similarities with a tempera formerly in the Sanseverino Vimercati Collection, Rome (Busiri Vici, op. cit., p. 423, fig. 6). We are grateful to Professor Alberto Cottino for confirming the attribution on the basis of photographs.